I just want to share a card with you that I made in support of my fellow design team members over at CTO. This week theme is anything birthday, but it must have a flower. I hope you enjoy this card. Please stop by CTO and submit your entry into this challenge. Comments are welcome! Enjoy and GOD Bless! OMG! I do enjoy this card! IT is awesome! love colors! I sure would like to get my hot little hands on that cuttlebug folder! Do you know if it comes with a bundle of folders? or if its still available? TFS! Great colors! Love the face in the flower. Thanks for joining us at CTO. I love the smile on your flower. Great job. This is so cute! I love the little face on your flower! Thanks for playing along with Team 2 this week!! 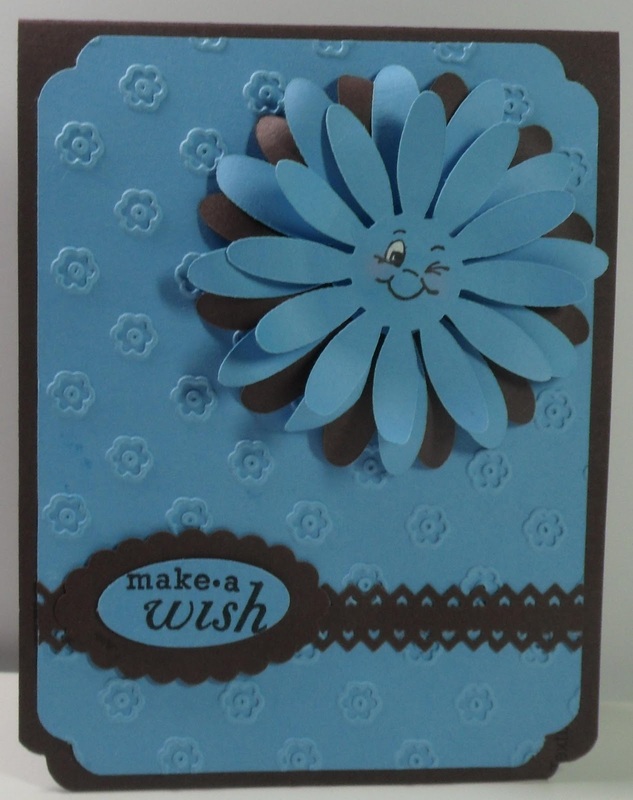 Love the blue and brown combo! Cute! I got to find that Cuttlebug folder! 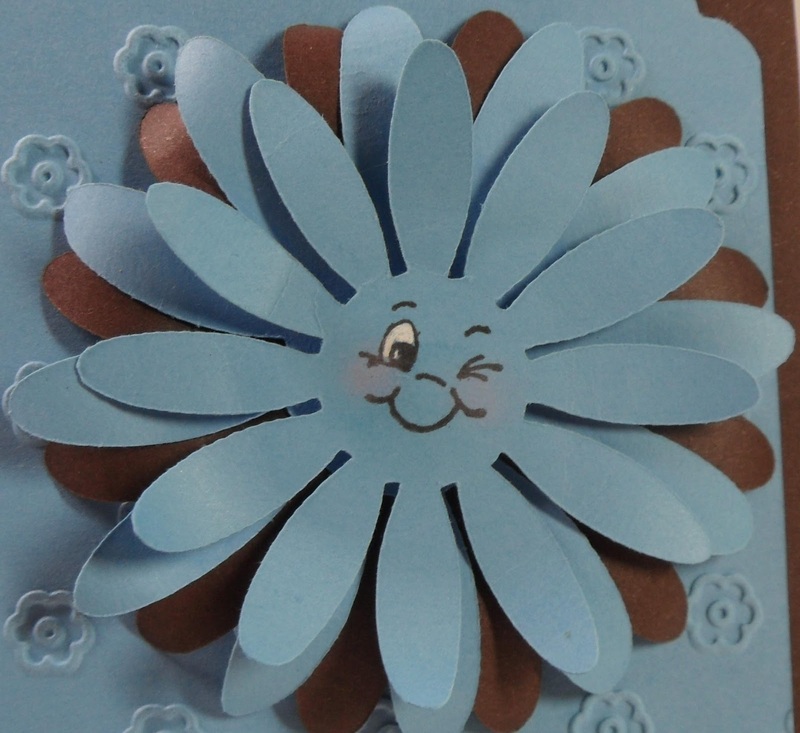 Love the colors..this is such a happy card..
Love that sweet face peeking out from the great big flower! O how cute! I love the flower and her face! And that embossing! 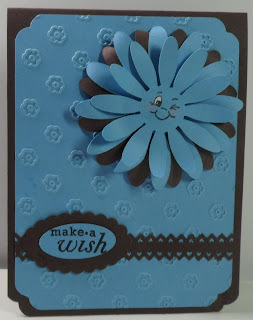 Great card and I love that embossing folder too. Thanks for sharing. What a pretty card! Cute little face on the flower! Beautiful card... just elegant! Love the embossing and ribbon. Wonderful card. What did you use to get your corners shaped that way? This is just fabulous! I love everything about your cards! I owe you a bug apology, I just saw a comment you left February 6th with a blog award. I am soooo sorry I didn't see it sooner. LOVE this flower soo much she is such a cutie!!! Thanks so much for sharing your DT talent at CTO this week!! Love the colors you used and the face in the flower is adorable! Such cute cards! Stop by my blog later today as there will be an award waiting for you! Oooops! Sorry for calling you Girlia, when your name is Gloria! :o) Silly me! Absolutely adorable, love the color combo.